Josh Wilkins refused to be intimidated by the scoreboard. Strengthened by what he has overcome to emerge as one of college hockey's most dangerous centers, the Providence junior was hardly rattled after an early Minnesota State onslaught left the Friars down 3-0 just over 11 minutes into an NCAA Tournament regional semifinal on March 30. Despite struggling with dyslexia, Wilkins is earning a college degree. That means he is used to rising above his own doubts and any doubts others may try to plant in his head. The Mavericks, however, did their best to make doubters out of Providence and nearly took a 4-0 lead, but the goal was waved off. "I'm afraid 4-0 could have been a dagger for us, but once that goal was called off, it gave us and the crowd [at Providence's Dunkin Donuts Center] a little jump," Wilkins said. "We've been down before and come back. We're comfortable with working our way back into games." The Friars received a power-play opportunity soon after the no-goal call and Wilkins took advantage with a powerful one-timer from the left circle that sailed past Minnesota State netminder Dryden McKay. Wilkins' goal ignited a furious rally as Providence erupted for six unanswered goals in a 6-3 win. He added another power-play goal in the third period to make it 5-3, just 1:18 after assisting Tyce Thompson on what turned out to be the game-winning goal. The comeback was astonishing considering that Mavericks' goaltender Dryden McKay hadn’t given up more than two goals in 16 straight games. Minnesota State had also been 25-1-0 when scoring first and 22-1-0 when leading after the first period. "Obviously, Josh's first goal was huge because it meant we went into first intermission down only 3-1 and with some momentum," Friars coach Nate Leaman said. "Also, we had been down 3-1 and 2-0 against Boston College recently and came back. The message was just to stay with it, keep playing our game. Our captain [Kasper Bjorkqvist] did a great job of reminding everybody of that before the second period." Providence continued staying with it in the East Regional final against Cornell, blanking the Big Red, 4-0. Wilkins added another goal and assist and was named the region's Most Outstanding Player. As a result, the Friars have returned to the Frozen Four for the first time since Leaman guided them to their only national championship in 2015. Providence (24-11-6) faces defending national champion Minnesota-Duluth (27-11-2) Thursday at Keybank Center in Buffalo. 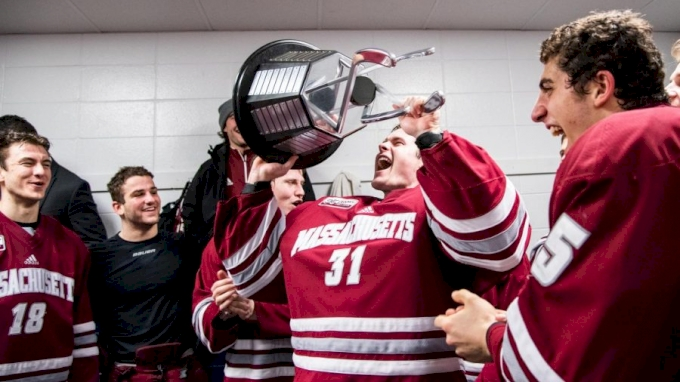 The winner tangles with either UMass (30-9) or Denver (24-11-5) in Saturday's national championship game. "We've had confidence all year in the kind of team we have, but we've also been waiting for everything to just click and that happened against Minnesota State and Cornell," Wilkins said. "Hopefully, that will carry into the Frozen Four because Minnesota-Duluth is a hard-hitting team that also has plenty of skill. I think we've done a pretty good job of dialing the down the celebration of winning the regional and refocusing on preparing for our next test." Wilkins has done a pretty good job, to say the least, of increasing his production and filling the void left by the departure of two of the Friars' top three scorers—Erik Foley and Brian Pinho. Moved from right wing to center a line featuring Bjorkqvist and freshman Jack Dugan, Wilkins is tied for eighth in the nation and second in Hockey East with 45 points (19 goals, 26 assists) after finishing with 31 points in each of his first two seasons. He is the first Friar to reach 45 points since 2003. Wilkins also has 16 power-play points (7-9) and is a healthy plus-11. He has been clutch with two game-winning goals and eight game-winning assists in addition to fashioning an NCAA-best 13-game point streak earlier this season. The Friars are 17-2-2 when Wilkins records at least a point. "I expected to take on more of a scoring role with Erik and Brian moving on, but that's been possible because of the great linemates I have in Kasper and Jack," he said. "They made my move to center, and being more responsible for moving and distributing the puck, easier. I was worried at first, but gradually became more comfortable and confident with my new role." Wilkins' comfort level and confidence have really been on display during the season's stretch run. He has 16 points, including 10 goals, in the Friars last nine games. "Josh has handled the move to center very well and it's led to more offensive opportunities for him which he has capitalized on," said Leaman, a finalist for the Spencer Penrose Award which goes to college hockey's top coach. "Josh has become really good at transferring the puck and leading our offense. He's also developed good consistency, having one good game followed by another. Much harder than it sounds." For Wilkins, increased mental toughness has yielded greater consistency. "I made the mental aspect of hockey a real focus in getting ready for this season because it's a bigger part of the game than people realize," he said. "Not getting frustrated with yourself or your teammates along with sticking together and sticking with our game plan is so important." Needless to say, Providence's Final Four berth has the campus and town buzzing. "Of course, everybody is fired up about it and we're confident a strong [contingent] of our fans will be in Buffalo after seeing us come back and make the Frozen Four after it looked like our season could be over," Wilkins said. "I've driven past plenty of restaurants and stores with signs showing their support. It's been incredible." Wilkins' rise through the hockey ranks began in the unlikeliest of places—Raleigh, North Carolina. It's an area more famous for college basketball, NASCAR, and the tobacco industry, but the state's NHL team, the Carolina Hurricanes, captured young Wilkins’ imagination. While he was becoming a huge fan of the franchise, Wilkins older brother Rich took up in-line hockey. Josh soon followed before transitioning to the ice when he was roughly eight years old. "I just loved the game and the speed of it," he recalled. "That was it. I knew hockey was going to be my sport." After proving himself on area teams, Wilkins began honing his craft far from home with teams in Los Angeles and Austin, Texas, where a 27-point (11-16) season and plus-14 rating led to him being drafted by the United States Hockey League's Sioux City (Iowa) Musketeers. Wilkins began appearing on the radar of some college programs and he became confident of his ability to thrive on collegiate ice. The classroom was another matter, however, as Wilkins' dyslexia left him wondering if college was right way to go. It didn't help that some people in his life were wondering the same thing. Wilkins seriously considered forgoing college for the Ontario Hockey League. He even accepted an invitation to the Windsor Spitfires training camp at age 16 before developing a steely determination to conquer his fear of college coursework. "I was never cut from the Spitfires when I went to their camp, but when I was there I just decided I wanted to prove I could handle college," Wilkins said. "I committed to doing what was needed to get through the NCAA Clearinghouse procedures to play college hockey and be accepted by a school." Wilkins found some colleges hesitant about recruiting him due to the dyslexia, but not Providence. "We watched Josh play in the USHL and knew he was looking for a smaller school with smaller classes sizes that offers academic support to students who need it," Leaman said. "It was a perfect fit. I was confident he would not only help us on the ice, but he would also grind a little harder when it comes to the classroom to overcome his learning disability." After also briefly considering Minnesota-Duluth and UMass-Lowell, Wilkins committed to Providence in the fall of 2015 just as his only season in Sioux City began. "Providence was the team that seemed to want me the most and would go the extra mile for me in my situation," Wilkins said. "I really liked the coaching staff. The size of the campus and classes were also perfect for me, so the decision was easy." Wilkins made an instant impact with 31 points (13-18), the most for a Providence freshman in two decades, including five power-play goals and a plus-14 rating. He was named the team's Most Valuable Freshman before also finishing with 31 points (15-16), including five game-winning goals, as a sophomore. This season, Wilkins has been named to the Hockey East First Team and the All-New England First Team. He was also a Hobey Baker candidate. Wilkins has kept his grade point average above 2.5. "That Josh is doing well in the classroom is inspiring to his teammates and a strong statement about our Office of Academic Support, but, ultimately, it's a testament to the strength of Josh's character," Leaman said. "He has not let dyslexia become a reason why he can't do something." Leaman feels Wilkins can do even more next season.